Fiction – paperback; Quartet; 112 pages; 2013. Translated from the French by Gael Schmidt-Cleach. Review copy courtesy of the publisher. There are two kinds of people who catch taxis: those that want to travel in peace and quiet, and those that like to pass time by conversing with the driver. In Maryam Sachs’ The Passenger, an unnamed woman falls into the latter camp. When she climbs into a taxi outside Charles de Gaulle airport to make the short trip home, she goes on a physical and figurative journey like no other — and all because she begins speaking to the driver. The story is narrated by an East German émigré, who is married with two adult children and lives in a Parisian apartment. She is returning from a holiday in Greece and tonight it is her son’s 21st birthday party. The taxi ride shouldn’t take longer than an hour but it invariably gets caught up in traffic and slows to a crawl. As she watches the all-too familiar scenery passing by and smells the Parisian pollution coming in through the open window, her mind drifts to the past, from her birth in West Germany to her father’s death when she was just a child, from her upbringing in her mother’s native East Germany to a thwarted love affair at university which resulted in an abortion — and all this by page 16. When she begins talking to the driver, she discovers he is Romanian and immediately the two begin to bond over their shared experiences as foreigners in France. He smiles for the first time and our eyes meet in the rear-view mirror. It’s like an invisible thread has just appeared between us. Over the course of the journey, which lasts a little shy of 90 minutes, the pair share stories and experiences from their lives. It is an intimate and important trip, one in which the road “we have travelled is more than just the distance between the airport and my house. No one’s ever taken me so far”. This beautiful and beguiling novella unfolds ever-so gently, drawing you in to the thoughts and memories of the narrator as she unearths her life, learning about herself and her driver at the same time. While much of what she recalls is sad — there’s an aching sense of loss throughout the narrative, of having to give up things or forget thing to move onwards — it has a strange meditative quality that left me feeling relaxed and at ease, almost as if I had plunged into a bubble-bath for a long, hot soak. We’re both silent, both lost in thought. We’re not paying attention to the sounds of the city any more. I feel so comfortable, at peace. It’s been a long time since I’ve been aware of the silence like this. It’s a silence full of meaning, a silence that knows it’s accomplished its mission. It fills me completely, I can almost feel it. I have no desire to break it. 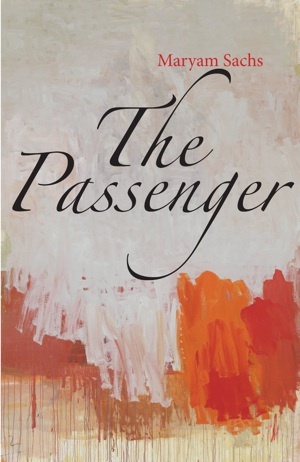 The Passenger is not only perfectly paced, it is filled with gorgeous observations and home truths written by an author with a perceptive eye. This eloquent tale about an unlikely friendship, about opening ourselves up to new experiences and not being afraid to share our stories with strangers, is both heart-warming and heart-breaking. But its real strength lies in the way it so wisely and astutely reveals how we can never leave the places that shaped us, nor forget those who have played such important roles in our lives. Who knew a taxi journey could be so enlightening? This sounds fabulous. I love immigrant stories and this fits the bill. It’s a really lovely read, Sharkell, so gentle but also profound. It is a fabulous novella, Mystica, and it is very much about immigrants and how we might be able to reinvent ourselves in new locations but where we are born/grew up shapes us very much. Hello Kim, I received my copy of The Passenger today, and I can’t think of any book delivery that’s given me so much pleasure. To think that you brought it all the way to Oz, and then when we couldn’t meet up found a way to get it to me via Sharon who then delivered it at the Stonnington Literary Festival where I had a gig chairing a panel session! The kindness of friends xo to both of you. Hi Lisa. It’s all largely due to Sharon, rather than me, because she was the one who suggested she could pass the book on. But very glad to hear you received it safely and I really hope you enjoy it. I’ll look forward to seeing a review on your blog in due course. Kim, if you hadn’t had the lovely thought of putting this book in your suitcase and bringing it all the way to Australia I wouldn’t have had the opportunity to pass it on! Thanks again. And so remiss of me not to comment with my thoughts on the book. I really enjoyed it, such a journey – literally and figuratively. It shows how some friendships are created – by chance and circumstance – and how talking about things with someone who has a different perspective can help you revisit episodes from your past and look at them in a different way. I would actually love to find out more of Maryam Sachs as she seems to have such an interesting background.